What do “the whole kit and caboodle,” “the whole shebang,” “the whole megillah,” “the whole enchilada,” “the whole nine yards,” “the whole box and dice,” and “the full Monty” have in common? They’re all expressions that mean “the entire quantity,” and they’re all examples of the breadth and depth of the English-speaking world’s vocabulary. 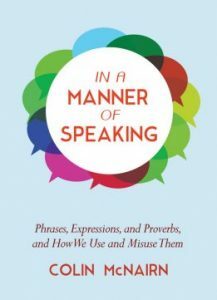 From the multitude of words and phrases in daily use, the author of this delightful exploration into what we say and why we say it zeroes in on those expressions and sayings and their variations that are funny, quirky, just plain folksy, or playfully dressed up in rhyme or alliteration. Some may have become clichés that, as it’s said with “tongue in cheek,” should be “avoided like the plague.” Others have been distorted, deemed politically incorrect, or shrouded in mystery and must bear some explanation. Among the topics the author delves into are expressions that shouldn’t be taken literally (“dressed to kill” and “kick the bucket”), foreign expressions that crept into English (“carte blanche,” “carpe diem,” and “que sera, sera”), phrases borrowed from print ads and TV commercials (“where there’s life, there’s Bud” and “where the rubber meets the road”), animal images (“a barrel of monkeys” and “chasing your tail”), and food and drink (“cast your bread upon the water,” “chew the fat,” “bottom’s up!”, and “drink as a lord”). Here’s a book for everyone who delights in the mysteries of language and the perfect gift for all the “wordies” in your life.